To be totally honest my journey into weight loss has been a rocky one. But it has not been completely worthless. I have learned so many things in these two months that I can't stop myself from advising someone else now. The most important thing in losing weight is eating right. If you eat more than you need then the next day all you're burning is the extra stuff you ate the night before. So for today's post I have a list of foods that would help you to get a glowing and rejuvenated skin. 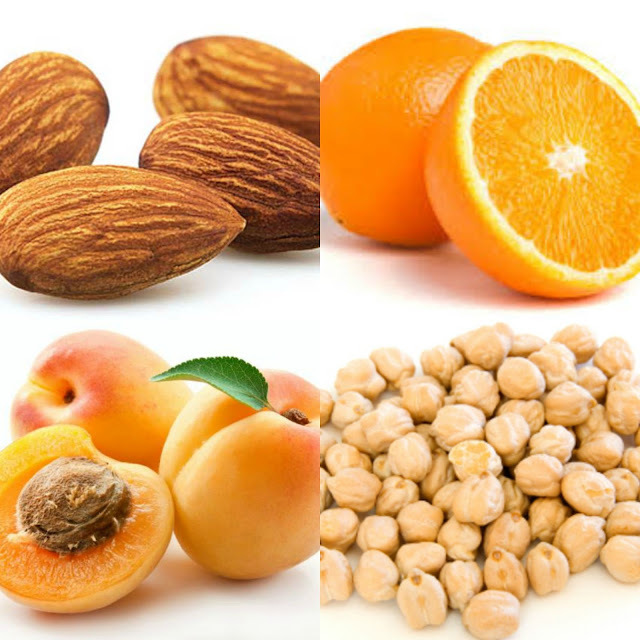 These foods will also keep you high on energy all through the day. ORANGES: The Vitamin C in Oranges banishes under eye bags. It strengthens collagen, the skin's supportive structure, to lift sunken areas that create shadows. APRICOTS: Our bodies convert Apricots' Vitamin A to retinol. a compound that helps produce new cells. ALMONDS: The Vitamin E in Almonds brightens drab hungover skin by neutralising free radicals, molecules that dull your look. Also, the fatty acids in Almonds make you gleam. CHICKPEAS: The Chickpeas help diminish scratches, scars and dark marks. Chickpeas' protein delivers the amino acids essential for tissue growth and repair. This is it for this post. To send me your feedback, send me an email or leave a comment below!